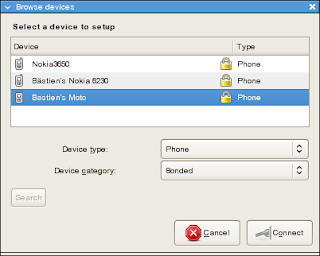 Last week, I did more work on the Bluetooth device selector, to avoid some of the problems we saw with the one in gnome-bluetooth (mainly the "I work with loads of nerds and there's 500 Bluetooth devices in the vicinity" use case). The patch is available on the bluez-devel mailing-list. It looks pretty good, but would require some work before it's something bluez-gnome can export as public API. Anyone fancying some cut'n'paste fest for gnome-phone-manager? How about a filter where typing in a search phrase narrows the list to only those matches. I'm doing that in one of my projects right now and it is a godsend for large lists. I'm not sure another filter based on text is a good idea. The already existing filters should allow users to trim down the number of devices listed, and it get completion via the GtkTreeView for free. Pet peeve: it needs to be "Select a device to set up", not "setup". "Setup" is a noun, like "login". "Set up" and "Log in" are phrasal verbs. This may sound a bit pedantic, but let's make our UI not look amateurish.